“Season ticket rates to London are £54 12s. per annum first class and £39 13s. third class.” Things were certainly different in 1939. 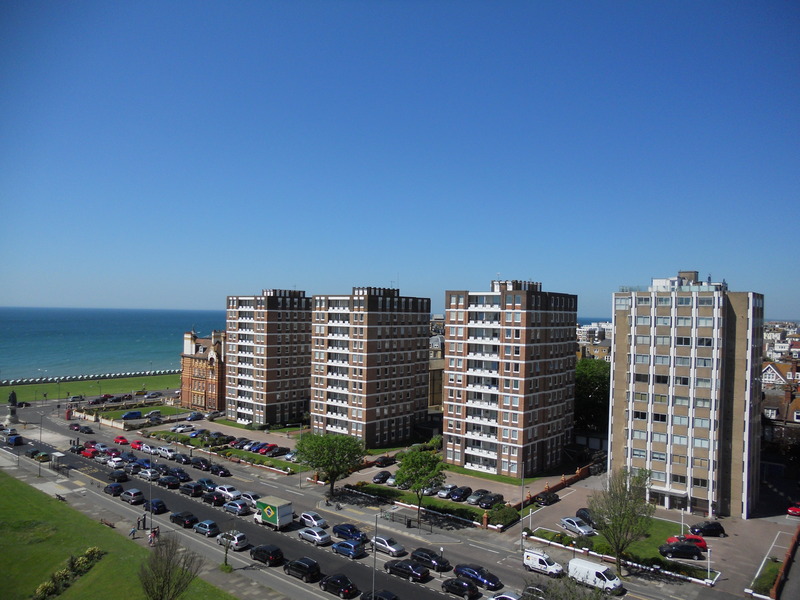 4 Grand Avenue is the monolithic sheer-faced block on Hove’s widest road. Its 1930s features are unmistakable and, like Furze Croft and Courtenay Gate nearby, it would make an ideal home for a certain Monsieur Poirot. Indeed, the original brochure for the block that I borrowed from resident expert David Hull is entitled “Particulars of a refined new building of 52 Family and Bachelor Flats in a distinguished position”. One of the balconied bachelor flats would have suited Poirot perfectly. 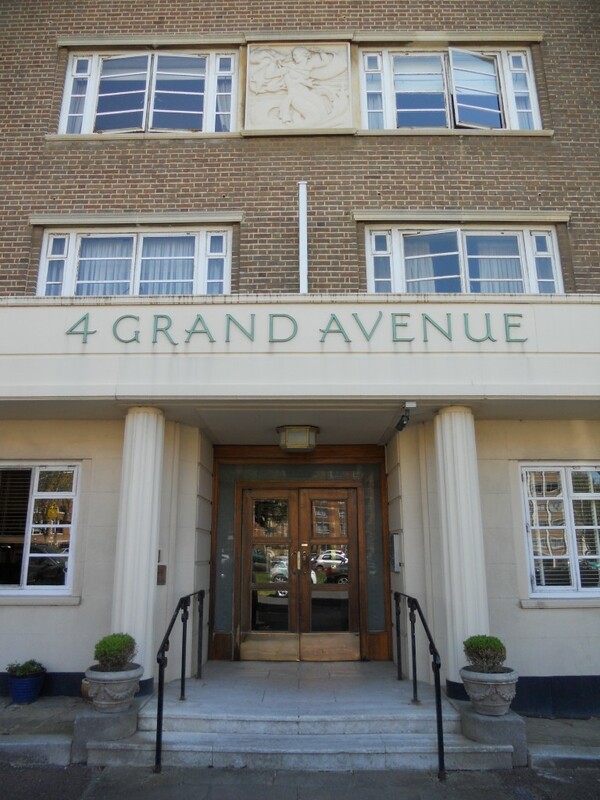 Like the King Alfred leisure centre on the Hove seafront, 4 Grand Avenue was built in 1939. They share a similar dark brown brick though the King Alfred’s Art Deco details are less pronounced. 4 Grand Avenue consists of ten storeys, including the basement which once housed a restaurant. As the brochure states, “On no floor are there more than six flats, and as the building is constructed in two wings, each with its own electric lift, there is complete absence of corridors with the service of one lift for three flats per floor”. It is interesting to note that the brochure mentions “fire-resisting construction”. On the basis that the brochure was produced just before the outbreak of war, I wonder if the building was later promoted as “bomb-proof”. Oher buildings of the period, such as the Dorchester Hotel in London, were described as such on account of their reinforced structures. 4 Grand Avenue replaced three large houses that dated from around 1880. They were of similar appearance to the neighbouring buildings, Nos, 2 and 6, which survived. No. 4, now a Grade II listed building, has been modified little over the years though several new flats have been squeezed in here and there. The grand foyer features fluted pillars and parquet flooring. Tradesmen can serve the building by using dedicated stairways and lifts at the rear (of which only one is in operation at present). Now that the residents are buying a share of the freehold, I would certainly be keen to purchase a flat there for myself. In fact, Hove estate agents Nash Watson are currently marketing the eighth floor penthouse on the south-west corner for £600,000. If my season ticket were to return to the aforementioned 1939 rate, I would be more than tempted.